On this very rainy and chilly day, baking cookies sounds like the perfect project. But there’s just one problem – the last thing I really need right now is a jar full of cookies staring at me. As Oscar Wilde said, “I can resist anything, except temptation.” So today I’m bringing you the fun and satisfaction of iced cookies without the calories (or the dough that refuses to roll out nicely!). Enjoy! 1. Fill one cup half full with hot water. 2. Now melt 1 oz of soap base in a cup (15 seconds in the microwave). 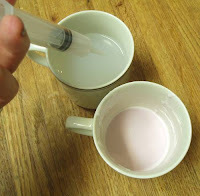 Stir in a few drops of Pink Frosting colorant, then a drop or 2 of White Icing colorant. 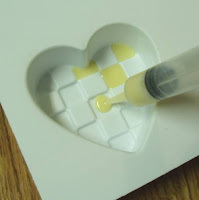 Draw up some soap in your injector tool and very gently fill the checker indentations. TIP: If you spray the mold with alcohol before you start filling the squares, the soap will flow into the corners much easier. 3. When done, squeeze excess soap back into mug, then draw up hot water to clean. 4. Repeat for other colors, using Buttercream Yellow and White Icing colors. Any pattern looks great – you can’t mess up! 5. Allow to harden. If you dripped onto any squares accidentally, use a toothpick or skewer to pick soap off. If the edges seem harsh, use your finger to smooth the soap lines back down. 6. Now melt 12 oz of clear soap base. 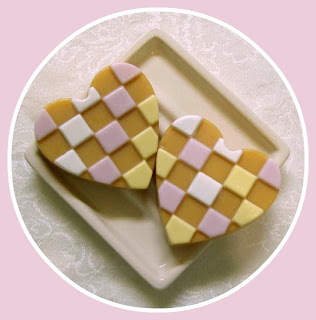 Color with several drops of Buttercream Yellow. You don’t want to start with Bakery Beige because sugar cookies are a soft color. Add one drop of Bakery Beige to get a more tan tone. It’s better to be light in this case. Now add 1 teaspoon of Vanilla Frosting fragrance oil and stir well. 7. Let the soap cool to 120 degrees. Then spray your checkered soap with alcohol and pour in beige soap. Only fill half way so they’re more like real cookies. Allow soaps to harden overnight and pop out. Put these in pretty treat bags and tie with ribbon. Your friends will LOVE this no-calorie surprise! Thank you so much everyone! I'm so glad you like the project! I agree with Hilary (often!) .. I just love this idea and you think outside the box all the time.. great lesson for us all! !